On February 28th Mount Doug Secondary will take the next step of collecting data providing the foundation for it’s developing “Active and Safe Routes to School Action Plan”. 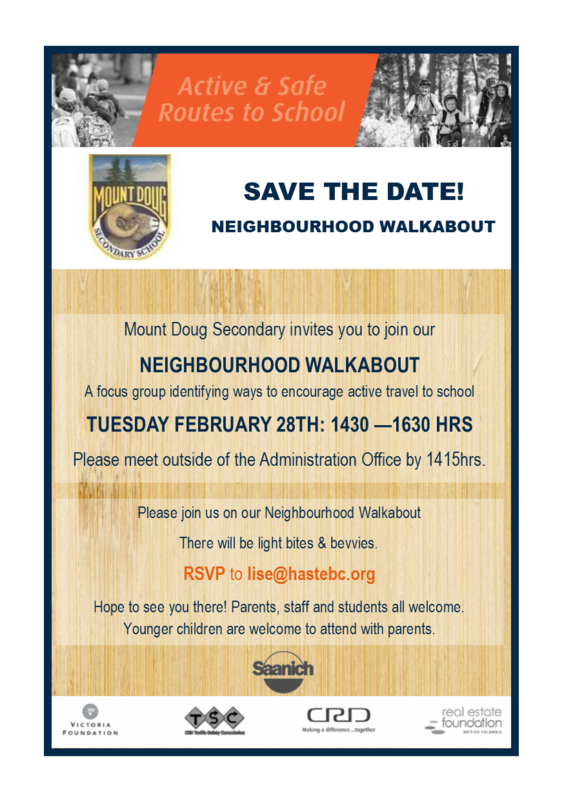 The Neighbourhood Walkabout is where the School Community (parents, staff, faculty and students) and External Community (Municipal representatives, Police, Island Health, Community Groups focused on mental or physical health, walking or cycling) get together. We will identify barriers within the neighbourhood creating concern among current or prospective active travel families while highlighting the areas favored by active travel families and ways to improve the use or experience. Active travel to school plays a positive role in many facets of our lives we don’t even realize. From the obvious such as physical health or environmental sustainability – active travel also improves family connection, creates a sense of community, assists with emergency preparedness and decreases symptoms or occurrences of mental health challenges such as anxiety or stress. Please join us! We would like to have at least four students or parents from the school community join us for this event. Share the word on your social channels and invite other school parents you know.